Rinnai offers quality and reliability compounded throughout a 45 year history of which innovation and improvements have been the keystone to success. Rinnai has always and continues to provide superior customer support before and after the sale of a tankless water heater including an industry-leading 12-year limited warranty. 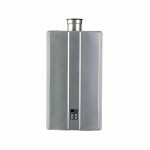 They have over 30 million tankless water heater installations worldwide and a good portion of those have been installed in Canadian homes and businesses. Rinnai continues to lead the way in efficiently heating water with the first system back in 1964, and today they remain the world’s largest gas appliance manufacturer. So you can be sure their products are of superior construction and thoroughly supported. The Rinnai tankless is designed to take advantage of a tankless water heater’s efficiency and flexibility saving you energy and money. 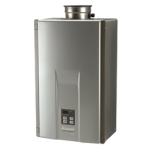 The efficiency of a Rinnai tankless water heater can be used to heat your home or cottage as well as provide space savings and hot water at both locations. The Rinnai tankless can be used with controllers (remote controls) to set precise water temperatures, from multiple locations in your home. This system will ensure comfort and prevent scalding accidents. lastly, Rinnai uses a concentric vent pipe system which requires one penetration for both intake and exhaust gases, saving space and ensuring a fast, clean installation. 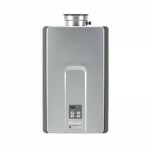 The Rinnai tankless is the 2010 Builders’ Brand Leader as chosen by home builders in Builder Magazine. The Alliance to Save Energy awarded Rinnai their prestigious Super Nova Star Award for energy efficiency and Bestcovery.com chose Rinnai as The Best Tankless Whole-House Water Heater system. 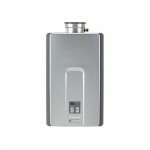 You cant go wrong with a Rinnai Tankless water heater here in Ontario.